One of three contenders for Aidan O’Brien, Magic Wand arrived a maiden after two runs but she benefited from an excellent pace-setting ride in the hands of Ryan Moore. Smartly away on the rail, Moore made the most of his plum draw and could be called the winner at the top of the straight, winning by three and a half lengths as the 3-1 favourite. O’Brien’s second string Forever Together took the runner-up spot after suffering a troubled passed, with another Irish raider, Princess Yaiza, third for Gavin Cromwell. Moore said: “She was very smooth. Obviously she had the one stall and she got away well. “She had a good look all the way round there. She was looking at a car in front of her – there’s a lot to look at here. Kevin Buckley, Coolmore’s UK representative, said: “Obviously we’re very pleased with that, it was just her second run of the season and she’s improving all the time. “She’s a big, scopey filly and will have learned a lot there. Ryan got a really good feel from her. “As a half-sister to Chicquita (Irish Oaks winner), you’d think she’d have no problem staying further, so it bodes well for Epsom, trip-wise. Of the runner-up, Buckley said: “We were very pleased with her, that was just her first run of the year. She’s a sister to Together Forever (Group One winner) and you’d have to be happy. 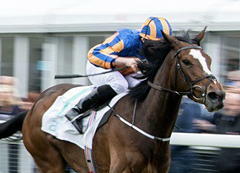 Cromwell said of the third: “I’m happy enough, she’s done well to get third from that draw (10).